Employer adoption benefits are benefits received from an employee to cover the expenses of adopting a child. They are similar to those received for traditional birth. Each company is going to have its own set of rules and protocols for receiving such benefits. I will try to outline a few of the potential benefits. Some companies will offer information services to their employees. This could include adoption agency referrals, support groups, organizations, and other options. This may be in the form of a brochure that can be handed out to the individual employee. Some larger companies may also offer access to an adoption specialist for the employee to ask questions regarding adoption. They may also help with additional resources to aid in a special needs adoption. As indicated above, each company will have its own benefits, if any, and how they are paid. I would highly suggest talking with the human resources department at your place of employment to find out what benefits they offer. Some examples may include a lump sum payment for an adoption. This amount could range anywhere from $500 to $15,000 depending on the company. 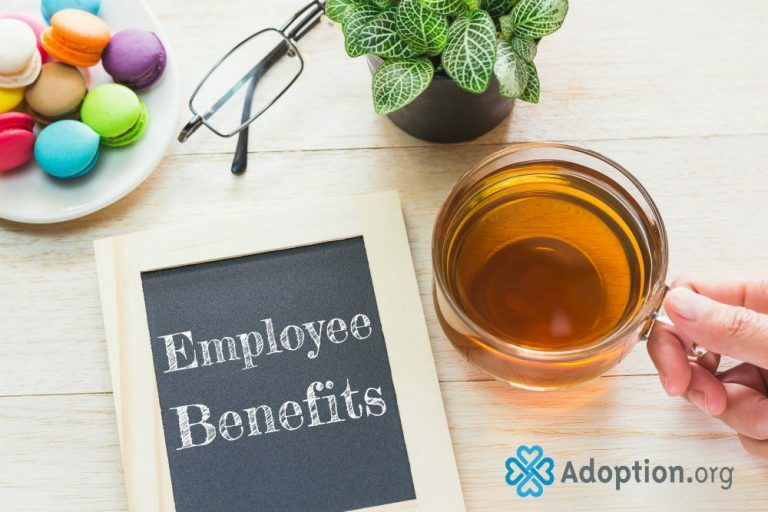 The company may also offer to pay directly for certain expenses related to an adoption, or they may make partial reimbursement payments to the employee for the expenses. Typically, the employer-provided benefits will cover public or private adoption agency fees, court costs, and legal fees. Some employers may also cover the cost of international adoption, as well as medical, foster care, transportation, counseling, and placement, or transition fees. In most cases, these benefits are paid after the adoption is finalized, although some employers may pay the benefits when the child is placed with the family, or the expenses are incurred. Most companies are required to allow adoptive parents a parental leave. Federal law requires any employer with over 50 employees to offer to both parents 12 weeks of unpaid leave during the birth or adoption of a child. The law is known as the Family and Medical Leave Act. Some employers will offer paid leave for employees as well, but may not be the full 12 weeks required by federal law. Make sure to check with the employer to see if they offer any paid time off, or if they have over 50 employees. If so they are required to grant at least 12 unpaid weeks off. When my husband and I adopted, neither of the companies we worked for offered any adoption benefits. However, I was lucky enough to take 16 weeks off when we adopted our son in 2014. I was able to work from home part-time, allowing me to take that extra time off. I would suggest talking with your employer to see if this would be something that could be worked out for you too. It may not be a monetary benefit, but the benefit of being able to stay home with your child greatly outweighs the financial benefit if you ask me!